The London native, who goes by the pen name Fuller, spent a week walking Beijing’s entire Sixth Ring Road in April. 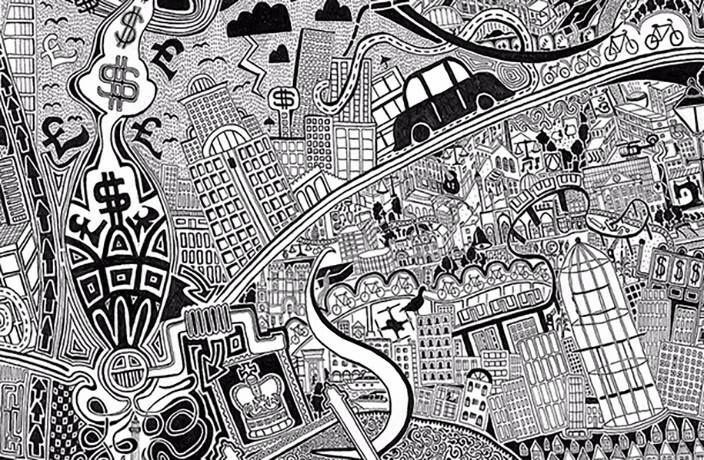 He was conducting research for an upcoming artwork – a black and white map of Beijing. But this isn’t a map in the traditional sense. The maps’ monochromatic color schemes produce surprisingly vivid and detailed depictions. Wood fills his pieces with cheeky and somber references, inviting observers to interpret symbols as they please. And the Sixth Ring Road walk was the necessary first step. To paint a city, you have to know it – borders and all. “[The walk] allowed me to understand the perimeter of my piece, because traditionally [the Sixth Ring Road] is the holding,” he explains. Beginning early in the morning and marching well into the night, Wood concedes the open road hike was “quite dangerous.” At one point he fell into a deep drain and twisted his ankle. Often the paths, which he tracked on Google Maps, would simply end, leaving him staring at bare riverbeds and unbuilt bridges. He walked through stretches of empty high-rises, which “felt like a film-set.” And after hearing a car-horn that wouldn’t stop beeping, it wasn’t until Wood came closer that he realized a man had fallen asleep on the wheel. When we meet Wood a few weeks after the walk, he’s barely sketched the outline of his map. Wood is prepared for a task of this scale, having already completed similar maps of London and Bristol. 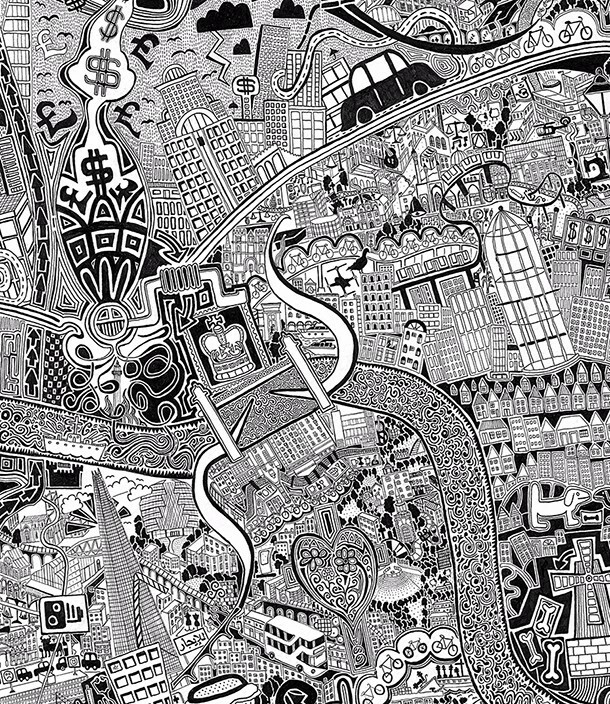 The former, titled ‘London Town,’ (detail pictured above) took a whopping 10 years to complete, and was acquired by The British Library. During our chat, Wood seems optimistic that his Beijing print will take considerably less time. For now, Wood is enjoying painting at his base in Tongzhou district during the morning and exploring the city by day. Wood admits to having a “crush” on the city. In addition to his cartographical print of Beijing, he hopes to complete various other works and eventually hold an exhibition. The Swedish post-rock favorites return for their fourth Mainland tour with a new album and a different sound that remains epic. Find out where all the parties are this weekend (and early next week) in Beijing. We're giving away two pairs of tickets to the show on Sunday, April 28.